Boccini Family portrait, Trieste, Italy, July 1936. Roger Boccini is held by his grandfather Carlo and to the right of them is his grandmother Berta. 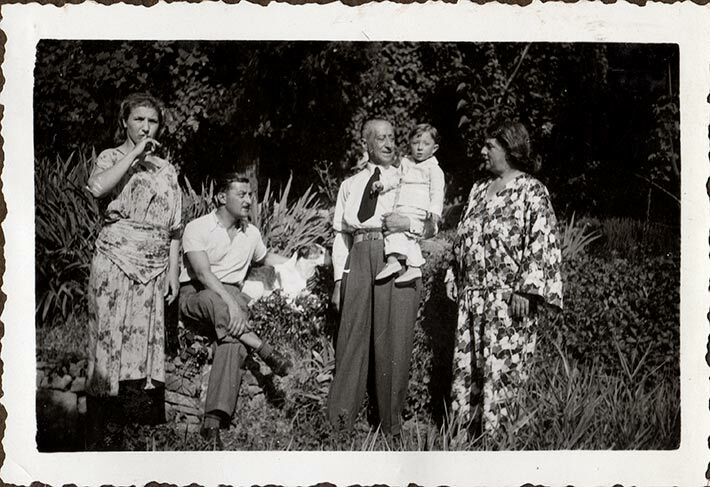 His parents Alberto & Elfie Boccini appear on the left. The Boccinis and their youngest son emigrated to Canada in 1937, leaving Roger behind with his grandparents. In Canada, the Boccinis settled in Vancouver, where Alberto became a leading member of the local Italian-Canadian community. He was arrested and interned as a threat to the Canadian state in 1940. Boccini contracted tuberculosis while interned at Camp Petawawa and was released as a result in March 1942. He died within two years of his diagnosis in December 1944. His wife moved to Montreal where she eventually married Gabriele Nincheri, the son of artist and former internee Guido Nincheri. She was reunited with her son Roger, when he immigrated to Canada in 1949.